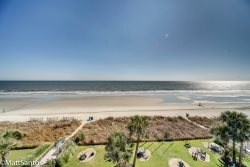 This upscale Myrtle Beach Condo will sure have you living the life during your stay at the Beach. With a spacious balcony with a great view of the Atlantic Ocean that also over looks the resort pool, that is a great feature on the property. The bedroom has a king-size bed and the living area has a queen-size sleeper sofa, making the condo able to sleep up to four guests comfortably. The kitchen comes fully equipped with a full-size refrigerator, microwave, oven/stove, dishwasher, coffee maker and all the dish/cookware you will need during your stay at The Horizon. The resort offers free Wi-Fi throughout. The unit has its very own washer and dryer as well as an iron and ironing board. The Horizon at 77th is in an outstanding part of town, located on the golden mile in Myrtle Beach, just minutes from everything Myrtle Beach has to offer. Come enjoy a relaxing vacation in this prime location along the ocean with perfect opportunities for fun, adventure and great memories! Explore the ocean view rooftop pool deck with a lazy river, pool, rejuvenation hot tub, indoor pool, and children’s pool. There is also a fitness cent on site! There’s a poolside snack bar and a casual restaurant serves food and cocktails at the adjacent Grande Shores Resort. Loved our stay and would definitely use this property again when traveling to Myrtle Beach! Your team was wonderfully helpful. They made our first Myrtle Beach trip a big success. Thank you all so much for that. We definately plan to return. Oceanfront Guru will be the company we work with when we do.